There are few things I dread more about amusement parks than the ticket prices, the lines, and the people. And, no, seriously, the people. 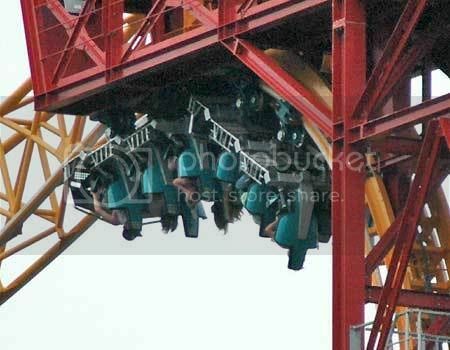 Although, getting stuck upside-down on a roller coaster–as these poor bastards in Arkansas did–is right up there. If there’s ever a time to worry about the effects of inhaling vomit up your nose, this is that time. Add a bad case of diarrhea contracted from swallowing too much water on a White Water Rapids ride and going blind from seeing one-too-many 300-pound, wet-t-shirted rednecks… and my nightmare is complete. So, in a power outage, the coaster’s brakes just kick in automatically, regardless of where it happens to be? Wouldn’t it make more sense just to let the thing reach the point of lowest kinetic energy on its own? I think I read somewhere that there have been nine deaths at Disney attractions. There’ve probably been even more, but they hide the bodies in the underground tunnels. You heard it here, first. That ride is frickin sweet though, seriously. Except it kind of locks you in this little box and you can’t move, which was kinda scary, and not in a fun way. The box holds four people, and you each get a responsibility, like engineer (lame), pilot (ok), gunner (pretty sweet) and commander (totally sweet). As you can probably guess, I was commander. I ruled that ship. Also, it has gary sinise, which is much less likely to cause suicide related death than the ride next door, “Ellen’s Energy Adventure”. I’d rather get stuck on the coaster, than fall off of one. OR! Get run over by one. Indeed. Although I wouldn’t mind going into the world of D&D on a runaway coaster. Previous post: Neo-Geo is dead. Long live Neo-Geo! Three-Wheeled Car Launched Into Space. Almost.